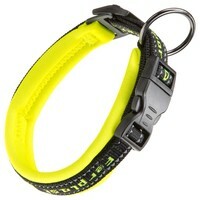 Ferplast Sport Dog Collar (Yellow) has been made out of nylon and given a particularly sporty design with thick, soft padding in fluorescent colours. Designed to fit your dog perfectly with a comfortable and secure fit, the collar also features reflective stitching and a sturdy fastening. There is also a tag between the outer material and the padding, on which you can write your pet’s name or address. Ideal for dogs of all sizes, the collar is available in various sizes and features a solid metal ring as a secure anchor to attach any lead too.